As Burberry's fall 2019 show started, a cast of characters began climbing the set — a collection of metal bars that resembled scaffolding. Gigi Hadid walked, in what was her first ever show for the legendary label. It was a collection that was clearly dedicated to the youth but also distinctly had a little bit of something for everyone: whether you prefer rhinestone fringe, sporty puffers or a classic tailored coat. Here's everything you need to know about the show. 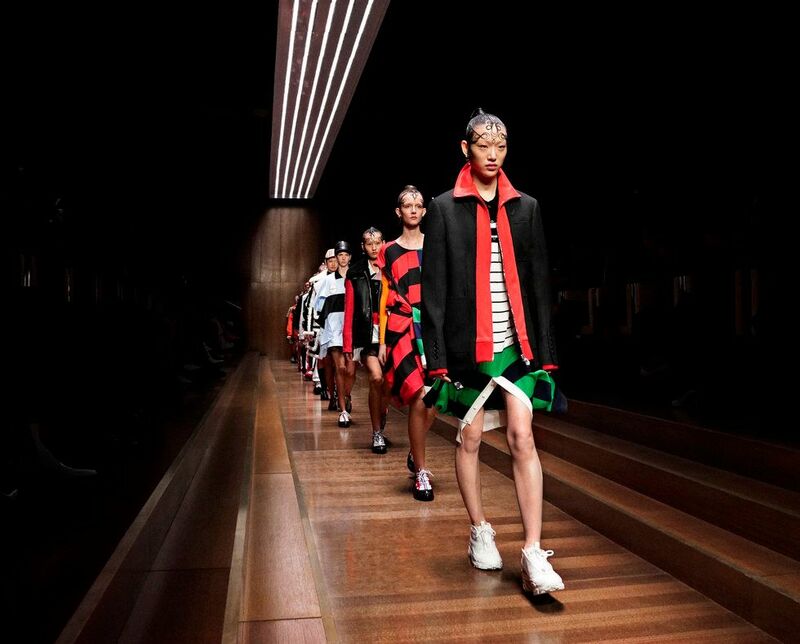 It was Riccardo Tisci's second collection as chief creative officer at Burberry. At an expansive 106 looks, it was the designer's strongest yet for the brand. On Instagram, Tisci dedicated the show to all the young cool kids. "I dedicate this show to the youth of today, to them having the courage to scream for what they believe in, for them to find the beauty in expressing their voice. I will be forever grateful to London for being the city that opened my eyes and mind and gave me the freedom when I was young to discover who I truly am," he wrote. 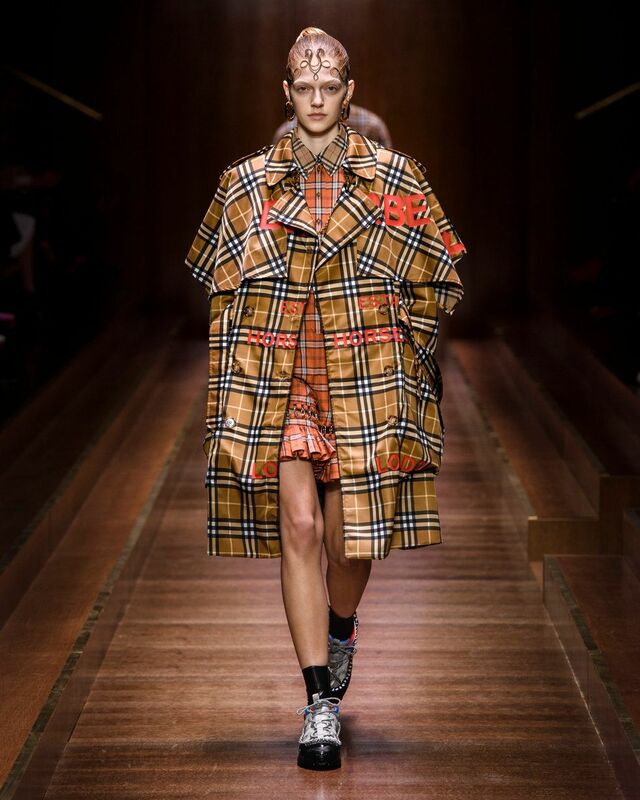 There were several pieces that included Burberry's reinvented check pattern. It was on men's and women's chunky puffers, on shift dresses and sweaters lined with leopard print. The newly revealed logo was also printed on skirts, dresses and the back of trenches. If we had to choose one category that stood out in particular, it would be the co-ed coats. 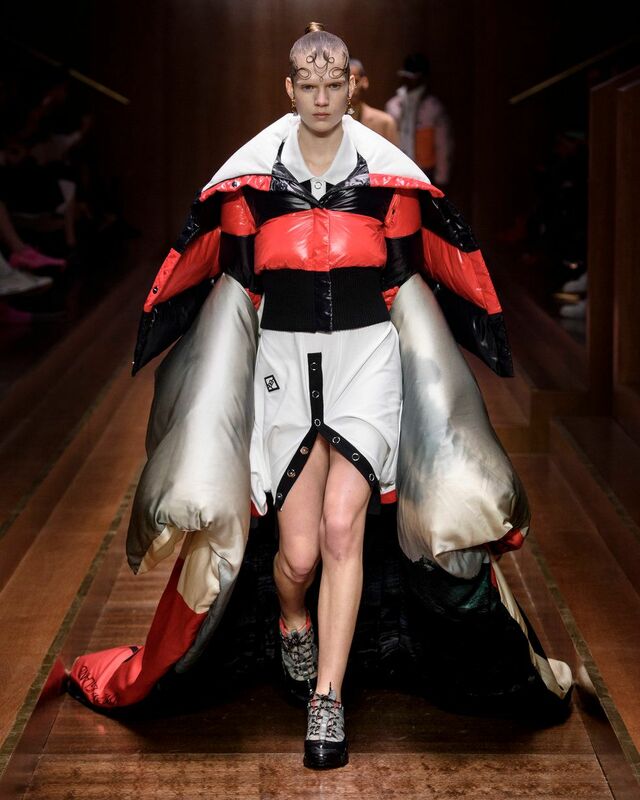 Each one was a statement of its own: there was a sporty black and white racer style mid-length coat worn by one male model, plenty of eye catching puffers and stunning faux fur pieces patched together and styled over street style ready hoodies. All the female models wore their hair back in tight chignons with over the top, stylized baby bangs. This, of course, meant there was plenty of room to experiment with unconventional earrings. That Tisci did: they came in chunky silver sculptural pieces and small crystal and hoop options. There was also no shortage of scarves, structural handbags and at least one purse shaped like an adorable animal, bound to be worn by and photographed on at least one cool kid before released later this year. Crystal trim covered the seams of lingerie inspired pieces that glowed as they came down the runway. Cowboy-like rhinestone fringe covered another shimmering look and toward the end of the collection, shiny sequins and metal piercings punctuated coats, scarves and gowns, all adding an extra ounce of glamour to a dynamic collection that appealed to both the casual crowd and the world's coolest glamazons.